Concert in the Park is a fun, family-friendly way to kick off your weekend – all summer long! 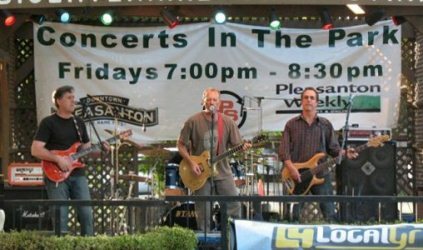 Visit Lions Wayside Park every Friday from June 1st to August 31st for live music, raffle prizes and fun from 7 p.m. – 8:30 p.m. Admission is free! Just bring a blanket or lawn chair and enjoy the show. Before the show, sit down for dinner or pick up something “to go” at one of Pleasanton’s downtown restaurants. Bring the whole family! Pack a picnic dinner (or buy a Costco pizza), bring some lawn chairs (or a big blanket), and head over to Greystone Park in San Jose for the summer series of Music in the Park. Every Thursday during the month of July, the shady park will come to life with a live band, lots of dancing, and dozens of kids playing on the play structures. It’s free, open for everyone, and an awesome way to enjoy a summer evening. The music starts around 6:30pm, but you can get there early to snag your perfect spot (or get their late and still find plenty of room). The show ends around dusk. If you live in Almaden Valley, considering biking over to the park as this week is a Spare the Air week. Announcing the 2012 concert series will be bigger and better than ever – featuring brand new genres, legacy bands, and Sactown’s hottest DJs! The local music festival starts in Cesar Chavez Plaza every Friday night from 5 pm to 9 pm May 4 thru July 27. Get a quick glimpse of all your favorite local bands before the season starts! Live Entertainment on Wednesday evening between 6pm – 8pm at Victory Park, 1001 N. Pershing Ave. Stockton CA. Spend an evening in the park with your favorite person, a picnic supper, and some great music as the Concert in the Park series continues for its 61st year. Concerts are free – Lawn chairs and picnics welcome! Join thousands of your best friends for six glorious Thursday evenings in downtown Modesto. This is truly Modesto’s best get together. So put out your blanket, pack your picnic and head to Graceada Park at Needham & Sycamore. Picknics start at 6pm and the concerts start at 8pm. for MoBand. If you are not into making your own picnic, many downtown restaurant will make dinners to go. Beer and wine are permitted in the park. The CreekWalk, at Andrews Park in Vacaville, is a place for everyone to have fun and relax in a community setting. It was started in Summer of 2000 and has been a growing success every year since. Enjoy music, sun and fun with friends and family while surrounded by a beautiful park setting. Vendors are available who provide cold drinks, food and desserts, and sponsors, organizations and other exhibitors display information about themselves. CreekWalk is for babies to grandparents and everyone in-between. $2 concerts and events sponsored throughout the Summer mean you never have to wonder what you’re going to do on Friday nights, or the 4th of July. Just come out and have fun! 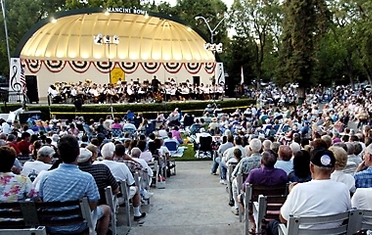 Starting the 3rd Friday of July, July 20 and every Friday through August 31st, 6:30pm – 8:30pm begins the 2012 concert serries. These concerts are held at Dorada Park, “Childern’s Play Park,” on A and 2nd Ave. They are free and offered to provide a family and friendly environment event. This is a sponsor funded event to cover expenses of advertising, security, and the bands. Bands are established Concerts in the Park. We look forward to seeing you there!